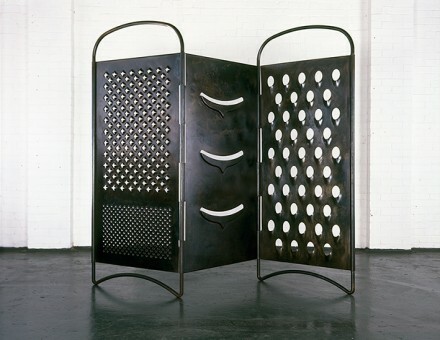 In her major retrospective exhibition, showcasing thirty-five years of ambitious and uncomfortable works, Beirut-based artist Mona Hatoum traces the scope her creative career, addressing her own political and aesthetic concerns in relation to nationality, identity, and spatial politics. Drawing inspiration from her Middle Eastern roots and the thematic interests of Surrealism, Minimalism and conceptual art, her exhibition shows over 100 works created from the mid-1970’s to the present day, including performances, installation, video, photography and sculpture. 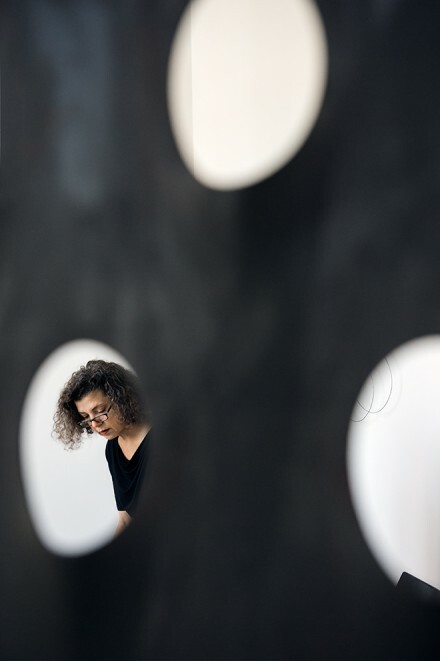 Hatoum’s early life was defined by national ambiguities, having been stranded in London as a 23-year old, when civil war erupted in her home country of Lebanon. 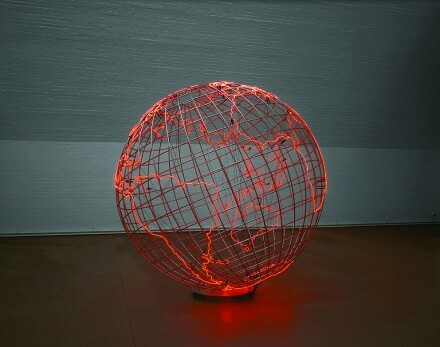 Hatoum would ultimately remain in London, and went to art school to study graphic design. She soon brought her creativity to more political and material interests as a practitioner in the fine arts, and her work has since reflected and manipulated the range of feelings she experienced during that traumatic time. Her initial works, video and performances that touched upon a divided reality, exhibit very powerful emotion and often evoke strong discomfort from audiences. As her artistic practice focused more on the personal and political, Hatoum began to create sculptures and large-scale installations which typically include familiar household objects or pieces of furniture. Her towering works, like a massive cheese grater strung out like a changing screen, are often disorienting in their combination of various elements and scenarios. Her work often infers expressions of torment, emotional suffering and hostility, and exemplify feelings of confusion and present conflicts and contradictions that both the artist and viewer must reckon with. 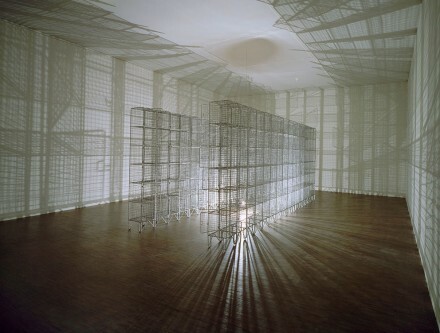 For instance, her 1992 installation Light Sentence, which includes an enclosure of wire mesh lockers outlined by a powerful light bulb, casts eerily foreboding shadows, giving a sense of enclosure and captivity despite their minimal material presence. The piece is meant to symbolize Hatoum’s own feelings and reflection of confinement and alienation, as small physical structures cast an impression of all-inclusive captivity. Hatoum’s exhibition presents her works as a series of visual metaphors, mirroring the personal and political complexities of her life, through which Hatoum, in turn, can challenge and disturb the public’s understanding of the world and its often static notions of statehood, law and human nature. Hatoum seeks to regain her own historic authority by bringing her truths and fragmented, trans-national experiences to the foreground. Through these difficult, often challenging physical spaces, the artist offers a way to work through the uncomfortable notions of modernity to gain greater understanding of the world she inhabits. 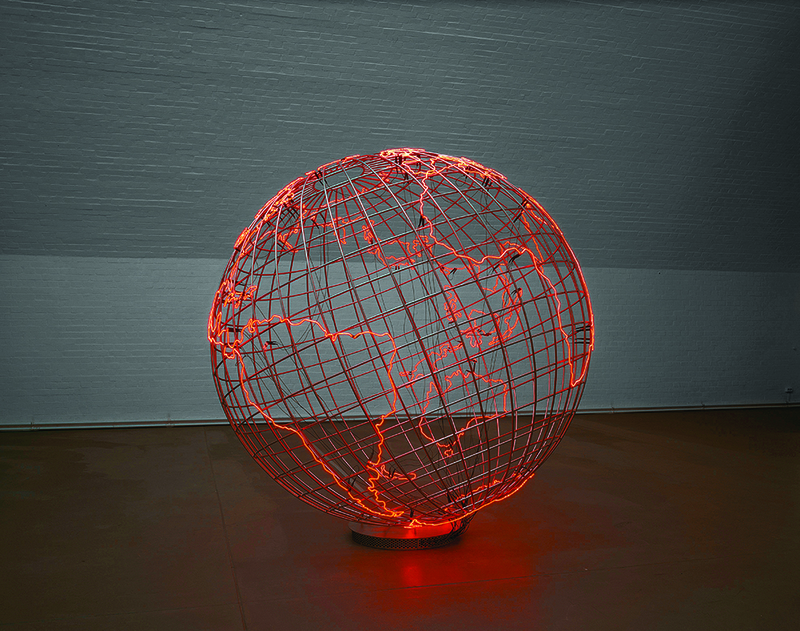 Mona Hatoum’s exhibition will be at Centre Pompidou through September 28th, 2015. The exhibition will travel to the Tate Modern from May 4, 2016 to August 21 2106. This entry was posted on Friday, September 4th, 2015 at 3:06 pm	and is filed under Art News. You can follow any responses to this entry through the RSS 2.0 feed. You can leave a response, or trackback from your own site.